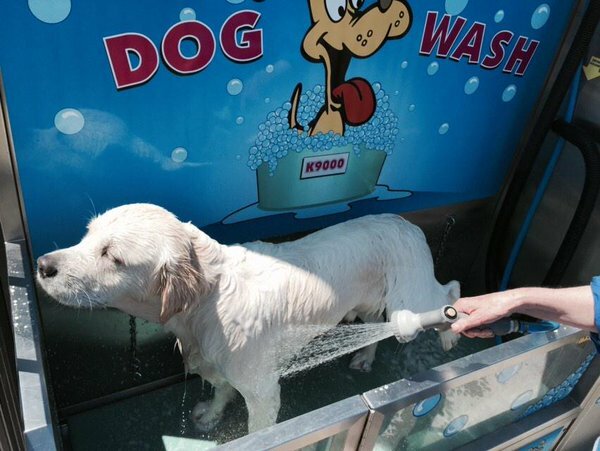 Why we think its important to wash your dog at Luxe Wash! Now that you have a clean, shiny car that looks brand new once again (washed at Luxe Wash, of course), you’re ready to hit the road, put the pedal to the metal and go on adventures with family, friends and dog in tow. 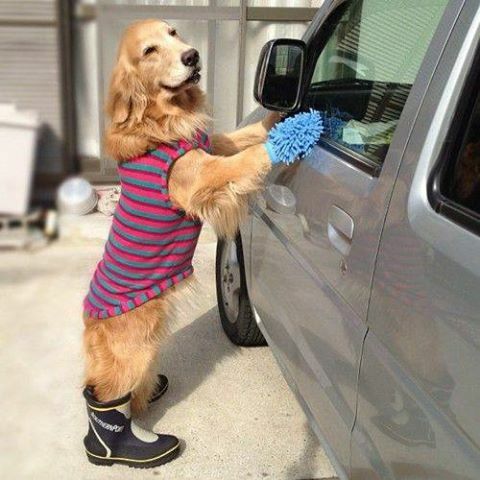 However with your newly clean car, you’re going to need a clean dog that will go in it. As cute as the pup may be, you don’t want those grimy paw prints to dirty the polished dashboard and freshly vacuumed carpet, do you? More importantly, keeping your dog clean is actually vital to maintaining their health and hygiene. Here are some im-paw-tent things to know when it comes to washing your dog. Running through mud, rolling on the floor and digging holes in the dirt may be lots of fun for your pooch, but it also exposes them to germs, parasites and fleas. Whilst it’s fine for your pet to have their fun, it is important to be aware and keep an eye on their skin and hair so that you notice if any concerning changes occur. The best way to do this is to bathe and brush your dog on a regular basis. A bath can be an easy way to check for issues on the skin, as the hair is wet and lying flat. Brushing your dog’s hair is also a great way for them to bond with you. When it comes to how often your dog should be bathed, it really depends on each individual dog and how much (dirty) mischief they get up to. RSPCA recommends that you wash your dog around once every four weeks. It is important not to wash them too frequently, as this can dry out the skin and contribute to skin disorders, as well as interfere with any external worming or flea treatments. How often your dog needs to be bathed can also depend on its breed. For example, dogs with an oily coat, such as Basset Hounds, may need bathing once a week, whereas dogs with thick, double coats such as Samoyeds are best to have fewer baths but more frequent brushing. Brushing your dog regularly is also important in grooming and maintaining their hygiene. By brushing your dog’s hair, you are able to check for fleas and dirt, and it also helps spread natural oils through their fur. Your dog will be pawsitively glowing! Some dogs can become overexcited when it comes to bath time, and others can become scared and anxious. Trying to make the experience fun for your pet, as well as starting a regular routine from a young age, can help make bathing a little easier. Whether your dog loves or loathes bath time, there are some important facts to remember. 1. Brush your dog before you bathe them. This helps to prevent knots in their hair, resulting in it to dry more quickly and not become irritating on the dog’s skin. 2. Use water that is lukewarm. Water that is too hot will burn your dog’s skin and cause them pain. 3. Use appropriate shampoo and conditioner. Products that have been specifically designed for dogs are more gentle and soothing to their skin. 4. Air dry. Either let the hair dry naturally, or use a hairdryer with lower temperatures that is specifically designed for dogs. 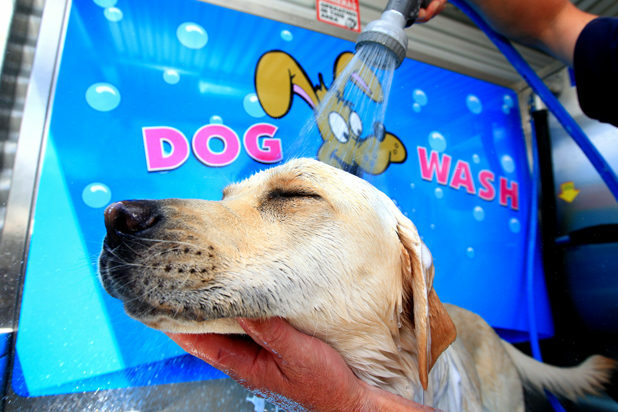 What is the benefit of using a dog wash? Washing your dog can be messy, and can end up taking you much more time than is needed to get the job done. Going to a professional dog wash can guarantee that your pooch is receiving the right treatment, no matter its shape or size. There are options where a professional dog washer does the job for you, or DIY places that provide you with the equipment and facilities for you to do the job yourself. Our DIY dog wash at Redbank Plains is convenient, quick and low cost. 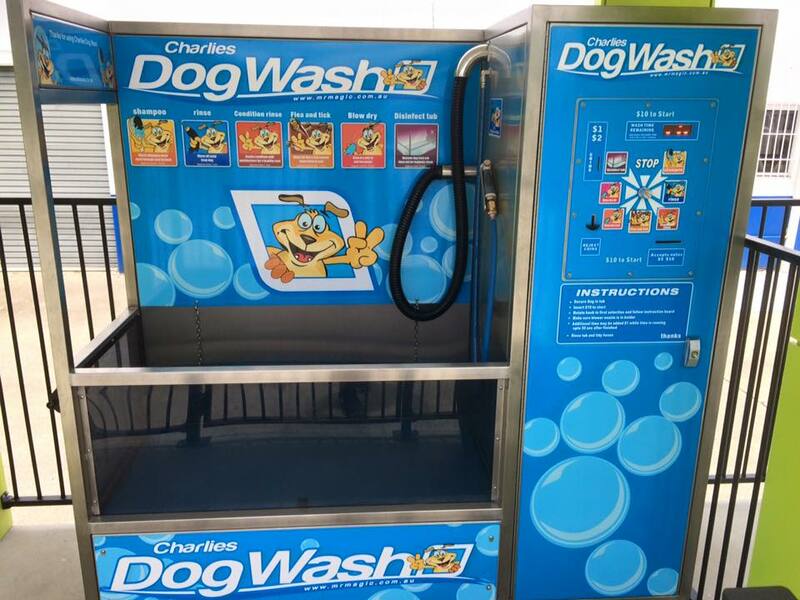 For only one dollar per minute, with a minimum of ten minutes, our dog wash bay offers everything at your fingertips, including shampoo, flea and tick conditioner, disinfectants and blow dryers. There’s no need for any mess and fuss at home, our bay can accommodate dogs both big and small.